Thank you for choosing Bekhic! Step 2. Open the mobile phone bluetooth and search "Air Headset", then connect it. 2.If only one earbud has sound at music mode, please try to recover the default setting. COMPATIBLE WITH MOST DEVICES: Can be used with all Bluetooth enabled mobile phones such as Apple IPhone 8 X 7 7 Plus 6S 6S Plus, as well as iPad 2, 3, 4, Android, Samsung, Galaxy, Bluetooth enabled smartphones and devices. 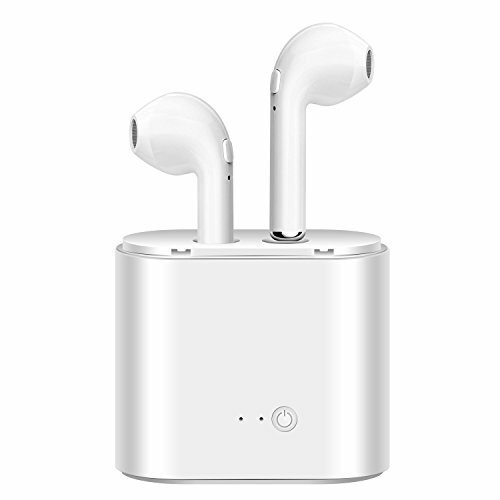 MINI WIRELESS EARBUDS - Fantastic TWS (True Wireless) technology makes wireless synchronous connection stereo pairing come true. Eliminate stethoscope effect of all wired headphones and noise reducing. Ergonomic design, secure fit, provide long time comfortable wearing. STEREO SOUND: High quality CSR chips, these earbuds deliver Hi-fi stereo crystal clear sound, great noise canceling effect, let you focus on your favorite music anywhere at anytime. Bluetooth pairing, power on and power off, pretty easy to use. If you have any questions about this product by Bekhic, contact us by completing and submitting the form below. If you are looking for a specif part number, please include it with your message.